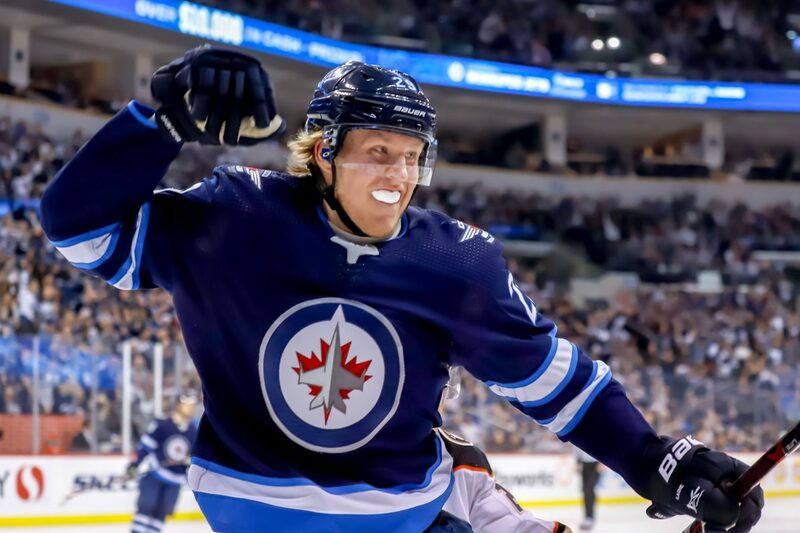 How Patrik Laine Can Break Out of His Slump - The Point Data-driven hockey storytelling that gets right to the point. No points, no shots, no shots attempted. 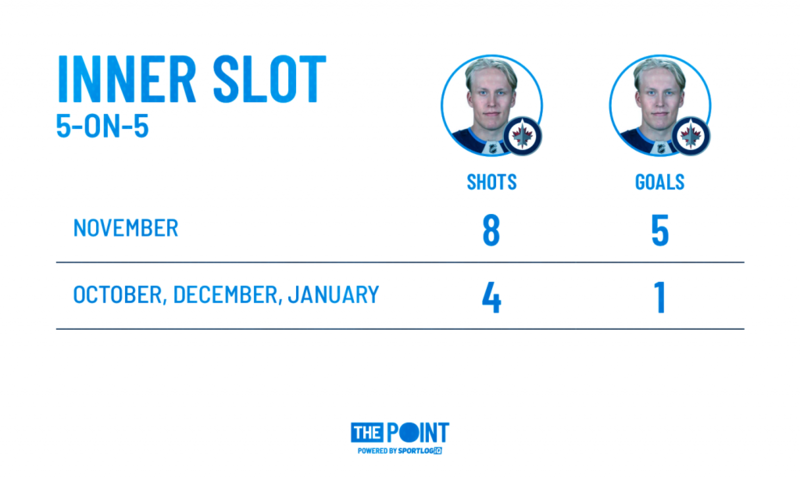 That was Patrik Laine’s stat line in Tuesday night’s shootout win against the Boston Bruins. Laine was benched for much of the 2nd period and saw just 10:55 of ice, the second lowest total of his career. One of the most gifted scorers in the game has seen the well run dry recently, scoring just twice in his last eighteen games. Thanks to one of the greatest goal scoring months of all-time, Laine is still on pace for 40 goals but if he wants to start scoring more consistently, he needs to start scoring more 5-on-5 goals by going where a majority of those goals are scored. Laine is going to get his cookies on the powerplay – he’s tied for 3rd in the league with 11 powerplay goals and has one of the best shots in the game. However, at 5-on-5, Laine hasn’t been able to fill the net at the rate of other top scorers in the league. Here’s some simple math. An area of the ice I talk about a lot, not arbitrarily selected, is the most high-danger scoring area in hockey, the inner slot. This season, 59 percent of 5-on-5 goals scored by forwards have come from this small but critical scoring area. In October, Laine didn’t have a single 5-on-5 shot on net from here. He also didn’t have a single 5-on-5 goal. In November, Laine torched the league for 18 goals in 12 games. In terms of calendar-month goal-scoring, it was an almost unheard of total. Nine of Laine’s eighteen goals came at 5-on-5 with five of those goals coming from the inner slot. He finished the month with 8 inner slot shots, 3rd best on the Jets. In December and January, Laine has once again been noticeably absent from the prime scoring area on the ice at 5-on-5. Four inner slot shots in two months and just three goals at 5-on-5. So, through four months of play, here’s Laine’s 5-on-5 breakdown from the high-danger, inner slot. To summarize that graphic, Laine has 4 inner slot shots at 5-on-5 in October, December and January. That ranks 15th on the Jets. Josh Morrissey has more. Half of Laine’s 5-on-5 goals this season have come from an area that, save for November, he almost never goes to. 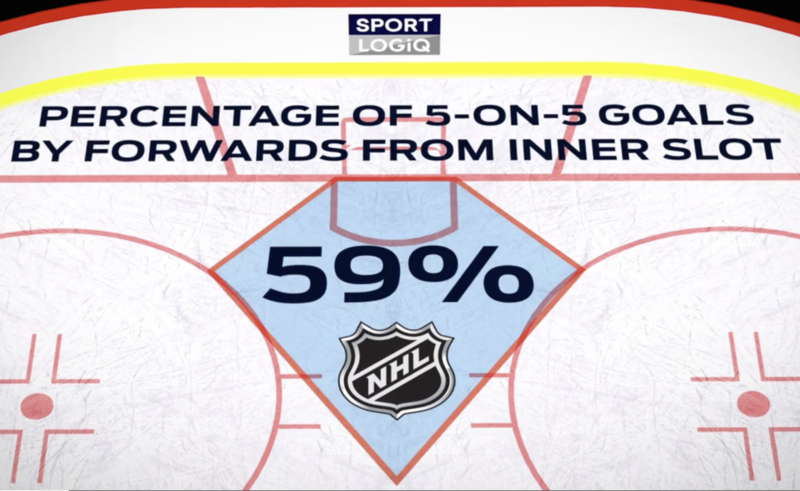 Even goal scorers with booming shots like Alex Ovechkin and Steven Stamkos understand that to score at a high-rate at 5-on-5, you can’t just hang out in the high slot and on the perimeter. Ovechkin has 34 shots from the inner slot at 5-on-5, Stamkos has 26 – Laine has 12 and half of them have gone in. Laine hasn’t been able to affect the game in enough areas to be absent from the goal column in 16 of 18 games. He needs to start scoring at 5-on-5 and the best way to do it is to play lower in the offensive zone. I’m not suggesting he park himself in front of the net but he needs to start working his way into the middle of the ice, below the hashmarks, anticipating rebounds and passes. I had a really interesting discussion with Colorado Avalanche captain, Gabe Landeskog at the All-Star game. Full article, here but the short story is that he wanted to break the 30-goal mark for the first time in his career. So, during the off-season, he looked at how certain guys got their goals and realized that, being a net-front player, if he worked on deflecting pucks he could add more goals to his game. He now leads the NHL in deflection goals and is tied for 5th in goal scoring with 29 tucks in 50 games. Laine needs to do what Landeskog did – find another way to add to your arsenal if you want to be the best player you can be. My suggestion, play lower in the offensive zone at 5-on-5. Laine is going to score goals, he’s too good not to. But, in order to bump his scoring at 5-on-5, impact the game on a regular basis and avoid being stapled to the bench, he needs to go where a majority of goals are scored in this game state.